Frontiers Health is the leading global conference focused on the future of digital disruption and technology within healthcare. It brings together leading experts from all stakeholder groups, including pharma, investor and start-up communities. The event delivers unique insights into the future of healthcare and the rapid development of digital health. To open up these learnings to the industry, pharmaphorum is on site for the two days and providing exclusive live coverage. PLUS: We have an on-demand video of the session chaired by our own Dr. Paul Tunnah on day one, debating the impact of digital health on pharma. You can view this stream here. We are also tweeting using #FH18. 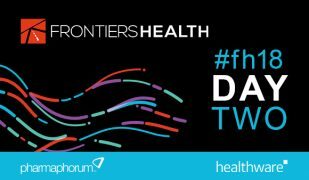 Day one coverage can be viewed by clicking on the image below, highlights include: digital health in Asia, deep insight into digital therapeutics and more. Similarly full coverage from day two can be found by clicking on the image below. Highlights include: The state of the digital health nation, exploring investment opportunities and digital therapeutic strategies.